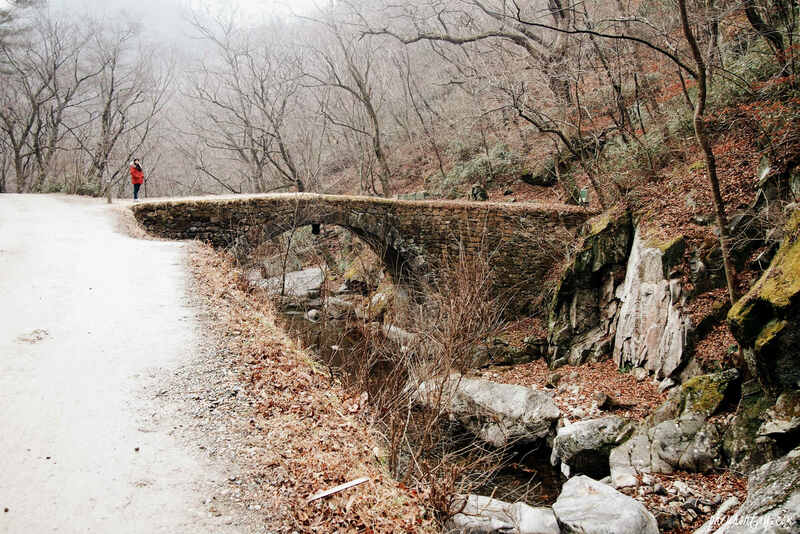 There are many places to visit during winter in South Korea. If you are not a ski person, do not enjoy hiking in snow, and maybe find Nami Island too mainstream, perhaps planning a little trip out of Seoul to Jeollabuk-do could be a viable option for you. 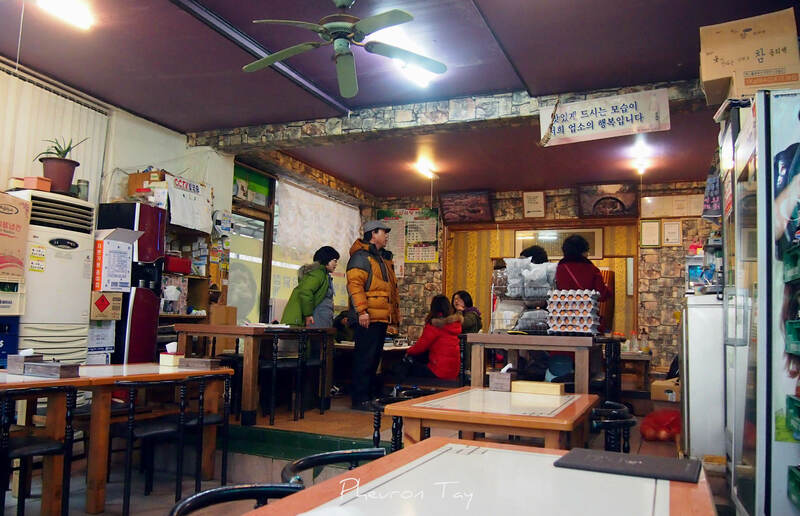 I visited Jeollado last winter and had 24 hours to cover Suncheon. I read about one day city tours hosted by the local government and decided to give a try. 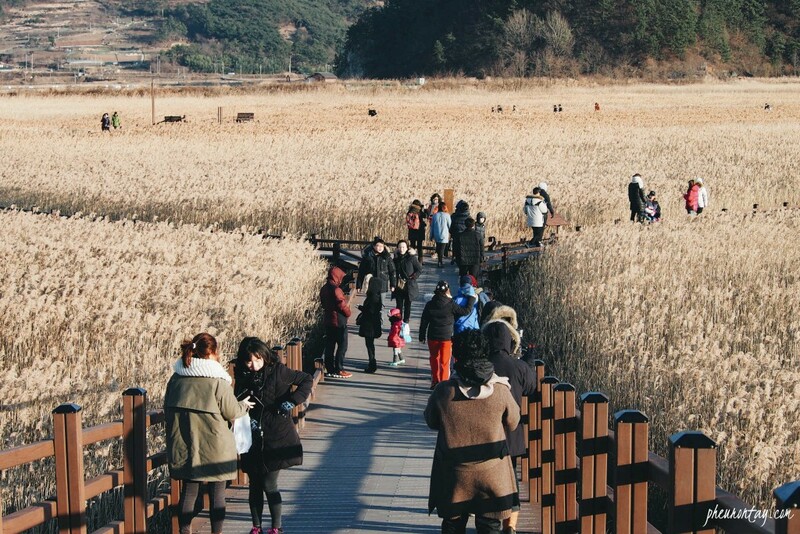 Basically, these one-day-trips that come with complimentary entrance tickets and transport are organized by the Suncheon local government to promote eco-tourism at extremely affordable price. There are various types of trips offered on the official site. Trips are categorized based on its nature (ecological, cultural, and “healing”). The most comprehensive ones that give you a mix of everything is their city tours. Links are provided at my verdict comment below. So here’s my honest review about the Suncheon City Tour hosted by the city government of Suncheon and hopefully, this write-up could come handy for your itinerary planning. Once again, all photos unless otherwise stated are taken by me. Any unauthorized use of photos is prohibited. None of these pictures may be reused in any form or by any means, without written permission. Please kindly write to me if you wish to reuse these photos. 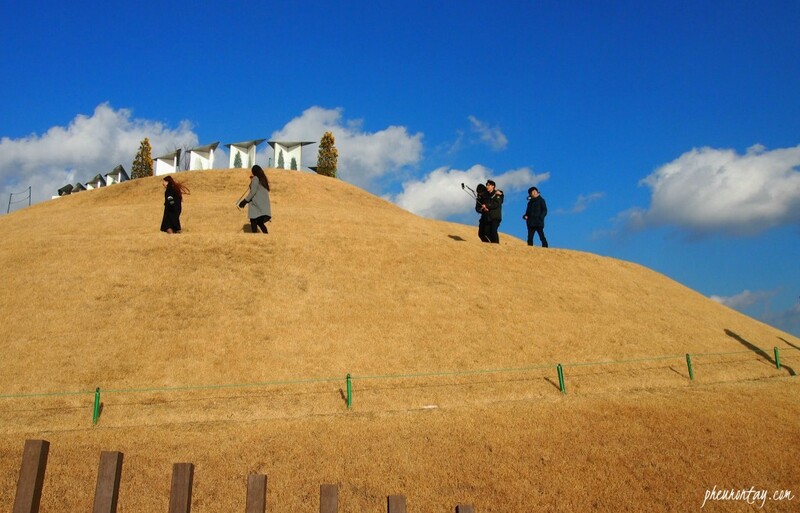 It is a southern coastal city at Jeolla-do province, also an up-and-rising popular travel destination for foreigners. 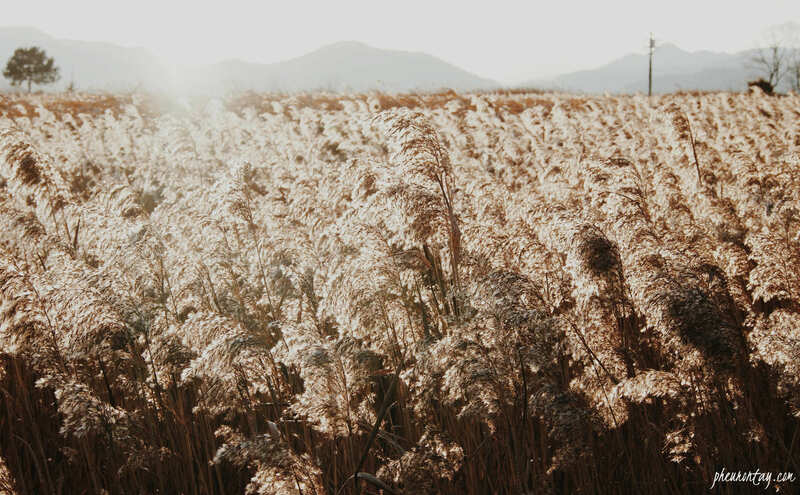 The city is undergoing massive development since it is part of the Gwangyang Bay Free Economic Zone, yet at the same time, some part of the city is restricted as an ecological zone to protect the natural ecosystem. The one-day city tour costs KRW 16,000 per adult, KRW 12,300 for Students, KRW 7900 for Kids below 12 yo and above 6yo, KRW 2000 for infants. It includes all entrance fee and transportation only. Prior reservation is unnecessary for foreigners. You may visit the tourist information desk to your right of Suncheon Station and sign up immediately. Please make sure you’re there at the info desk at 8:30am, as the trip starts at 9am and you’ll need fill up forms and payment etc. 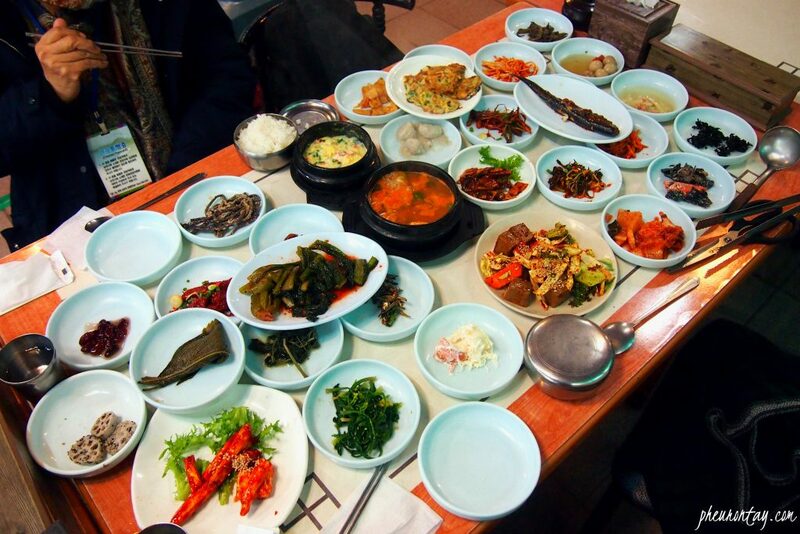 As the package is targeting the locals, the trip will be conducted entirely in Korean. The tour guide will be able to speak basic Korean, though. 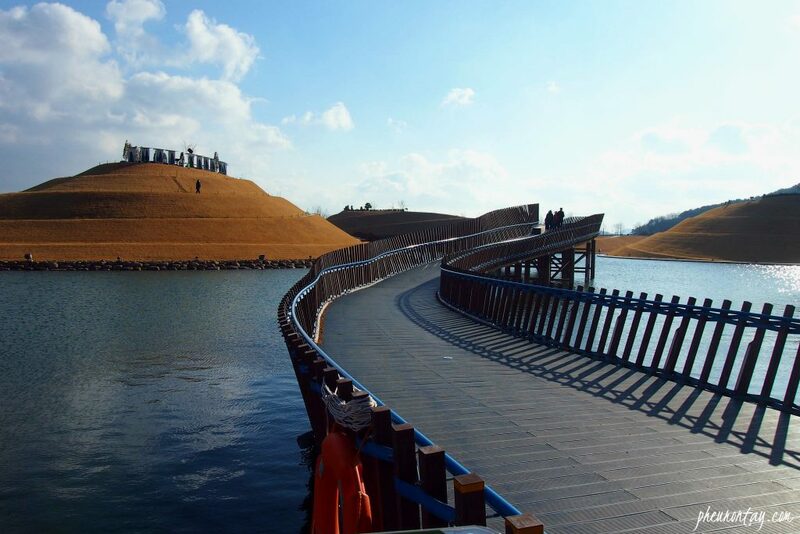 It is the most convenient and economical way of touring around Suncheon. Definitely recommend this tour to everyone. But the trip could be subject to availability, as the bus is limited to 40 passengers per day. If you are taking KTX to Suncheon: After alighting your KTX train, follow the crowd and the exit signboard, it will lead you to the hall where the train tickets are sold. Get out of the building from the main entrance, you’ll see the tour bus right at the end of the square, by the roadside. (Direction of yellow arrow). If you are joining their official tour, all you need to do is to reach Suncheon Station before the tour bus depart at 930am. The tour bus will be right outside the main exit of Suncheon Station. You’ll be travelling via the tour bus provided throughout the day. If you plan to do a free and easy in Suncheon, I am afraid you have to spend more effort on your planning because public transportation is quite a problem for non-Korean speakers. However, I figured their taxi drivers are kind and friendly. If you are not keen on having everything planned and studied before embarking your trip, taxi service is a good choice. However, do note that some places like temples are far away from the town and it could take you longer to finally hail one. I visited Suncheon right after my Jeonju Trip, stayed over at Suncheon for a night, and travelled back to Seoul via Korail Mugunghwa Train. 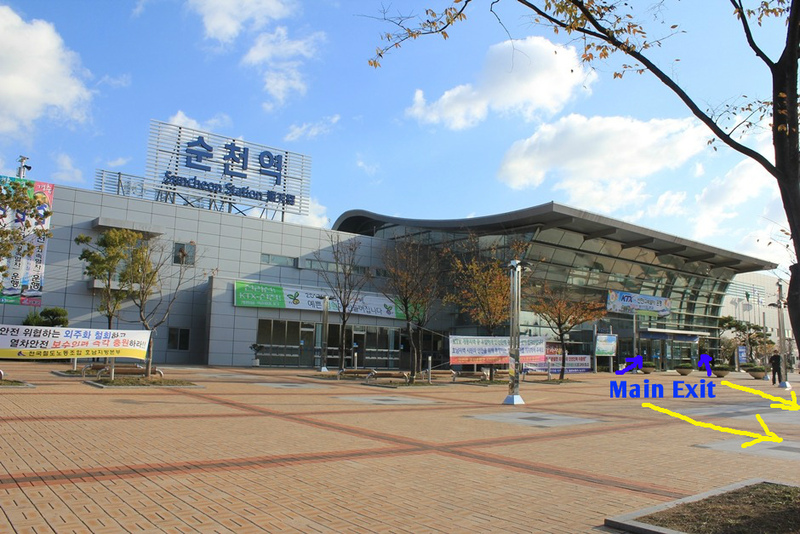 There are train services that connect Yongsan (Seoul) → Jeonju → Suncheon. However, trains provided every day from Suncheon to Yongsan are of limited frequency and usually ends in the noon so be punctual. The first stop we visit was Suncheon Drama City, a drama set made according to Bongcheong-dong in Seoul back in the 60s. Various dramas were filmed here at the fairly huge set. (No wonder they call it a ‘city’). It is divided into various sections, including the more westernized town area of the 80s and the neighbourhood area of the 60/70s. We were given about 40 minutes here. The 2nd stop was Seonam-sa, one of the prettiest temple in South Korea. It left me a very strong impression as I thought these destinations are just a few steps away from where we alight, more so if you’re joining a package tour. This place totally wow-ed me. We have to walk for about 1 km from the entrance to the temple, and then walk another 1km back to the car park. and we are given 1.5 hours ++ to complete the 2 km journey (that includes time to get our tummy filled for lunch!). Quite a mad rush for a slow traveller like me and my mom, but we eventually made it. I have blogged about the temple in another post earlier. Check out more pictures of Seonam-sa here. Lunch is not included in the one-day city tour. However, they do help to arrange your lunch upon request. All you need to do is to alert the driver before you went into the temple and he’ll make an arrangement for you, but you’ll eat what they arrange. We did not request this service simply because we felt like looking at the menu and choose what we like ourselves. We dined in at the restaurant the bus driver recommended, which is located near the car-park of Seonggwangsa Temple. Lunch of the day was Sanche-jeongsik 산채 정식, literally translated as “wild vegetables full course meal”, a type of meal commonly available in the mountains and near a temple. 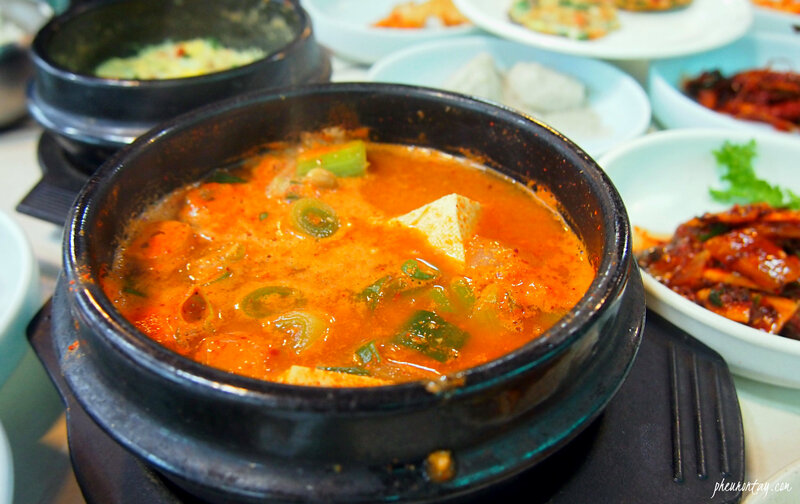 One of the must-eat when you visit a temple in Suncheon. 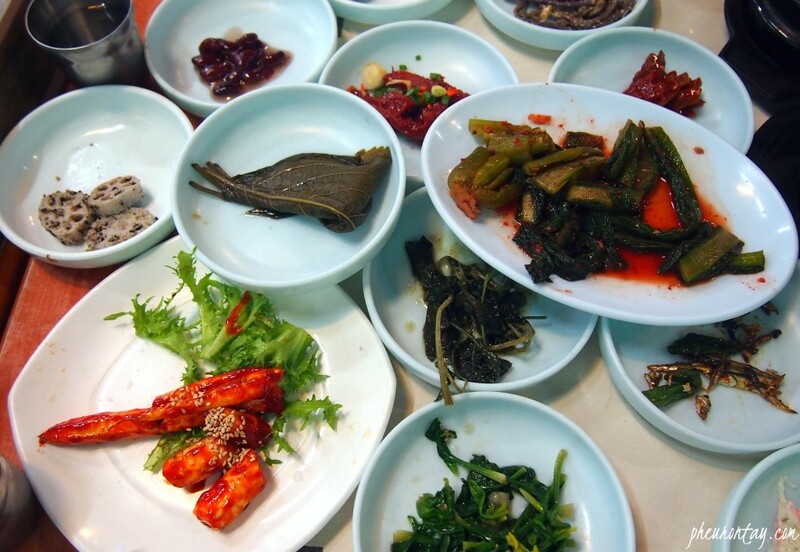 It was a down-to-earth yet sumptuous lunch with 27 refillable side dishes. The meal comes with grilled mackerel, steamed eggs and bean paste soup like what you get from usual jeongsik. 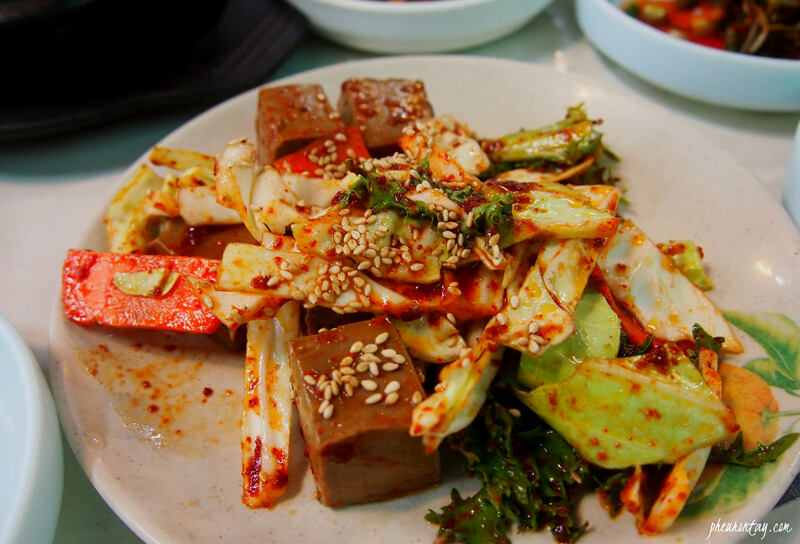 There are many pickled or marinated dishes of wild vegetables, Deodeok, roots of balloon flowers that I can’t name. 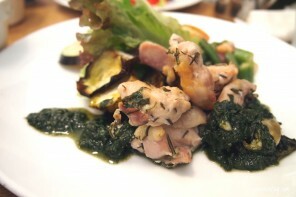 They might sound / look weird but oh well, me and my mom enjoyed the lunch very much! Everything for two costed KRW24,000, which was pretty reasonable. 763 Jukhak-ri, Seungju-eup, Suncheon-si, Jeollanam-do. 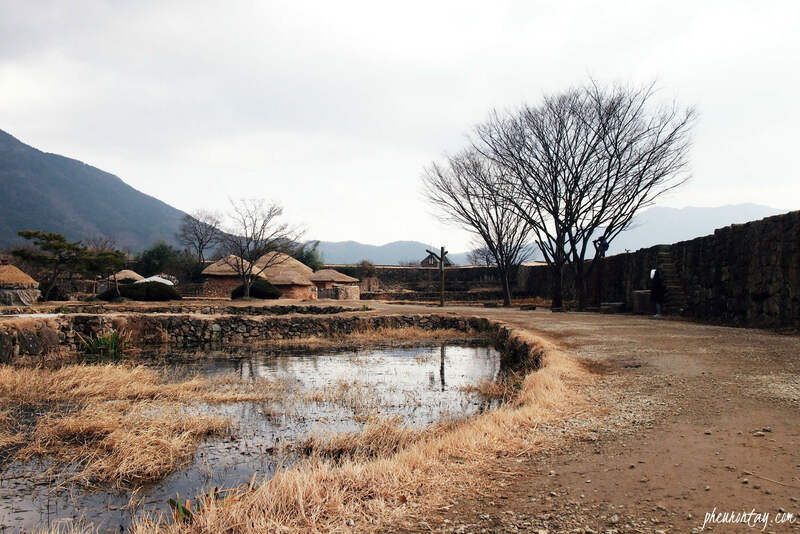 The Naganeupseong is considered one of the best preserved town fortress in Korea. It witnessed the wax and wane of Goryo and Joseon Dynasty, and remained untouched during the Japanese occupation. All artifacts are painstakingly preserved through the years, enabling its visitor to catch a glimpse of Korea some 600 years ago. Literary a living museum! We were given about an hour and 20 minutes here at the town fortress. You will see some government office and private housing, also trying out traditional costumes, braiding a grass slipper if you like. The fortress looks different in every season. 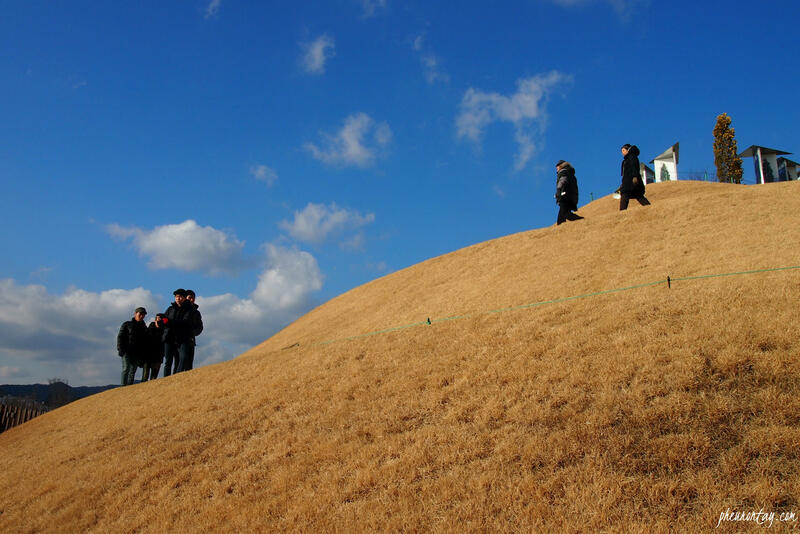 I have recently wrote about spring at Naganeupseong here. Check it out if you are interested. A garden built for the Suncheon Garden Expo in 2013, this park provides different mini gardens from many countries including China, Japan, European, Southeast Asian and North American countries. Not a fan of mimicked gardens, I took a very brief tour by taking their tour train and went straight to the Lake Garden located at the center of of Suncheon Bay Garden. 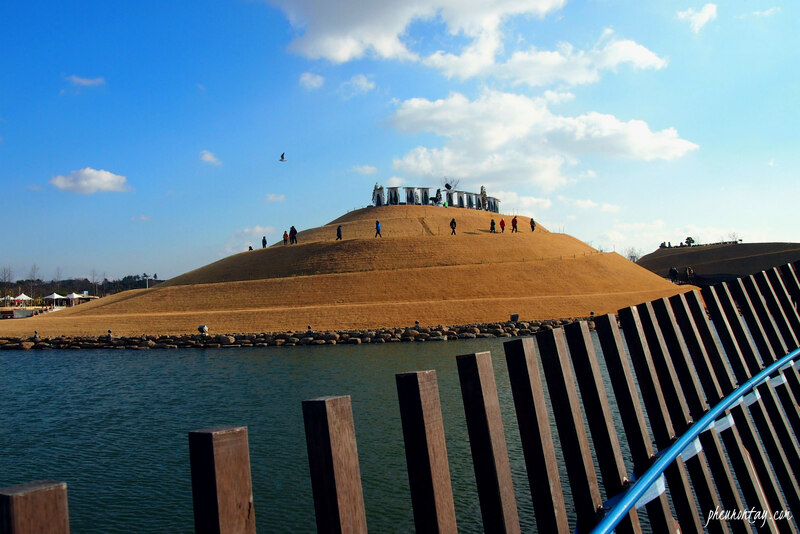 It is designed by renowned landscape designer Charles Jencks based on the unique topography of Suncheon. Quite an interesting place to take some quirky pictures. 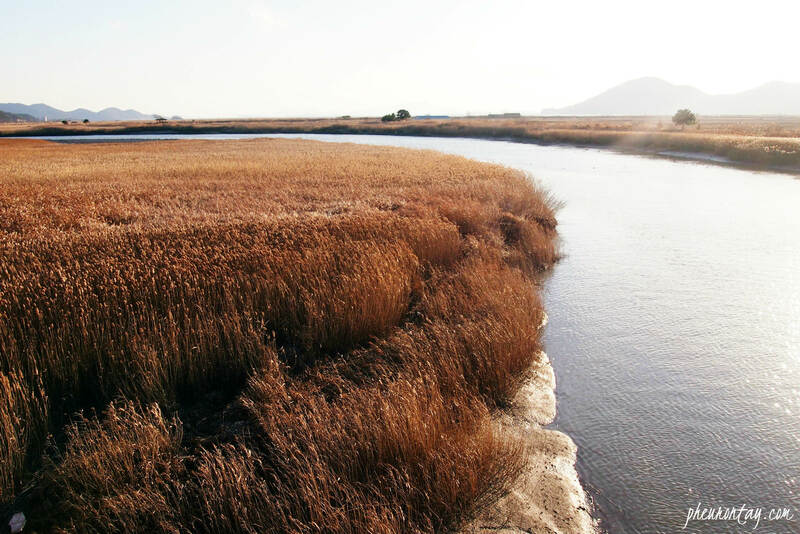 The last station for the trip was Suncheonman Bay, where visitors get to see beautiful wetlands and reed fields from an observatory up on a hilltop, which is located 2 KM away from the entrance. We are given an hour + here at Suncheonman. I must say it was already an eventful day, we have been trekking in the mountains, climbing up the steep slope at drama city and the fortress town and etc. A trip to and fro the observatory means a total 4 KM by foot, and all these got to be completed within an hour. I would say it is a mission impossible for an exhausted body. So we decided to just take a stroll at the reef fields and rest at the cafe nearby. View from the cafe overseeing the reed fields. 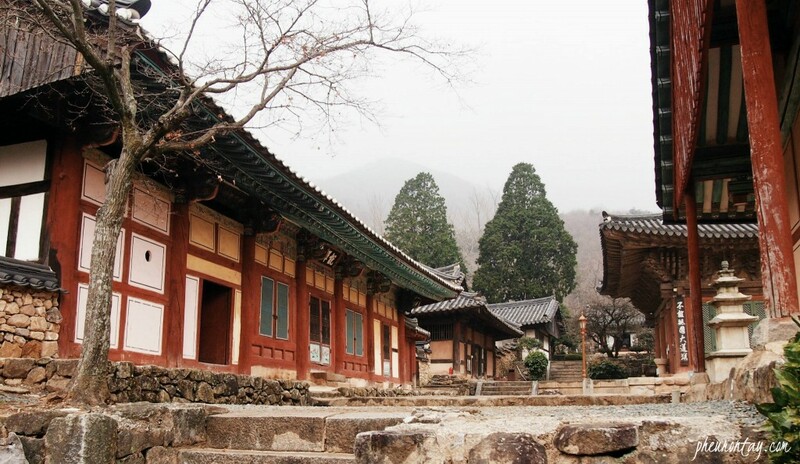 Firstly the tour itinerary: The itinerary includes all the major-must-see-sites such as Seongguang-sa Temple/ Seonam-sa Temple, Drama Set and ultimately the Naganeupseong, Suncheon Garden and Suncheonman Bay. But all these must-sees are covered within 8 hours, including travel time. That means you’ll have to burn a whole lot of energy if you want to explore each site to the fullest. Like what I mentioned earlier, completing a 4KM trekking up and down the hill within an hour, is simply too ambitious for an exhausted body. 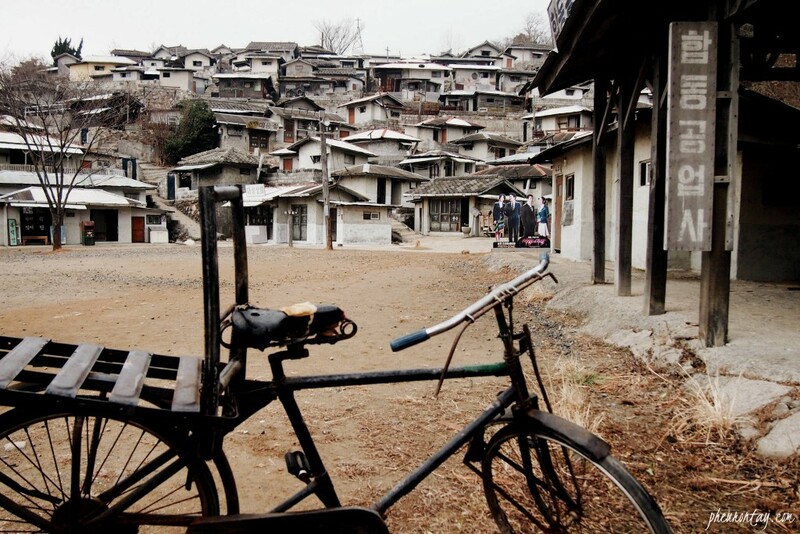 However, If you are short of time and want to get a quick understanding of Suncheon, this could be one of the options. 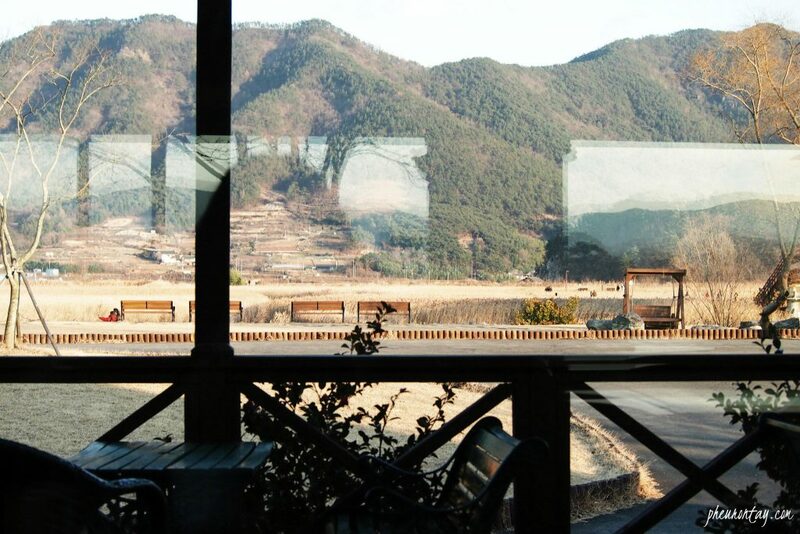 You get a full day transportation around Suncheon in just KRW 16,000. The bus driver and the tour guide are very friendly, but they speak limited English. It is crucial for you to understand at least intermediate Korean if you want to really learn something from the tour. Secondly problems with booking: Here comes the major problem for non-Korean speakers. Although their official site does come with English/Chinese/Japanese translated pages, the site to book the city tour package only comes in Korean. There are English/Chinese/Japanese tabs on the top right corner of the page, but none of the tabs seem to work. However, if you can understand simple Korean, you may still be able to book the trip by clicking 관광 → 시티투어 →예약하기. It seems to me that this day trip service is targeting the locals. (What a pity!) But if you have no problem with the language, or if you want to save up all the troubles of figuring out the transportation from point to point, you may consider this service. Also, please equip yourself with a good pair of walking shoes if you are joining the tour! 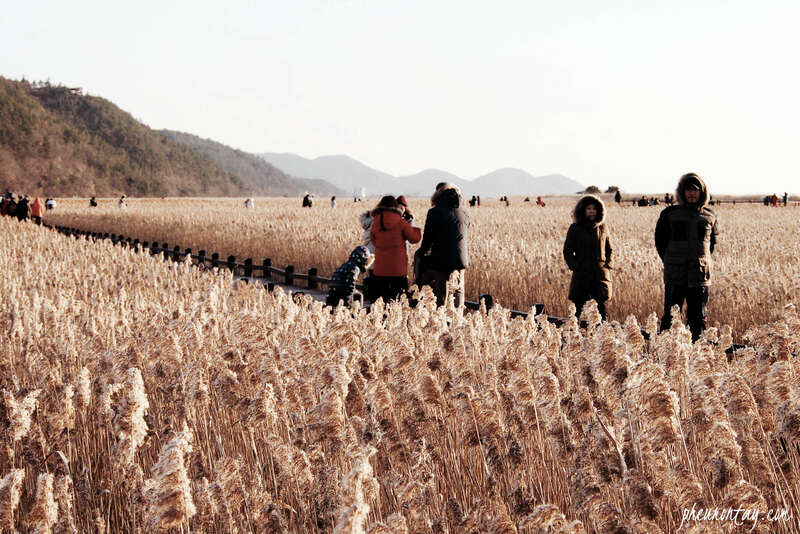 Overall, I think Suncheon is an ideal place to visit in winter. It is exceptionally beautiful when it snows. 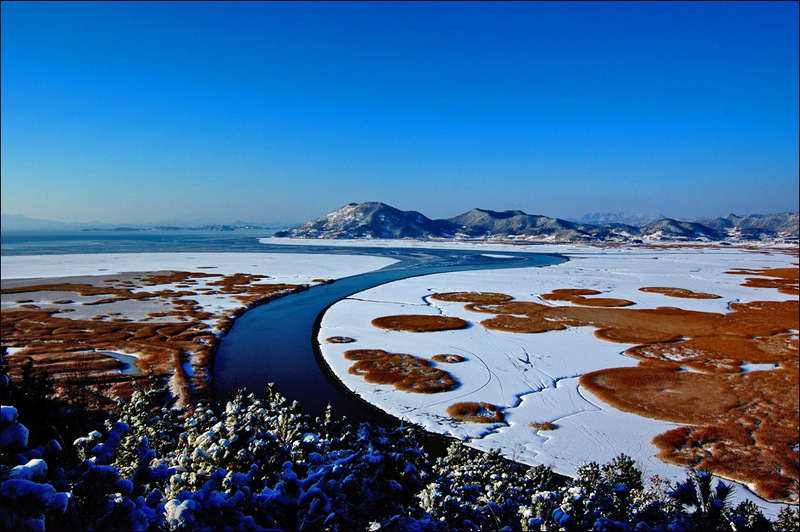 I have came across some breathtaking pictures of snowy Suncheon taken by some Korean bloggers online. 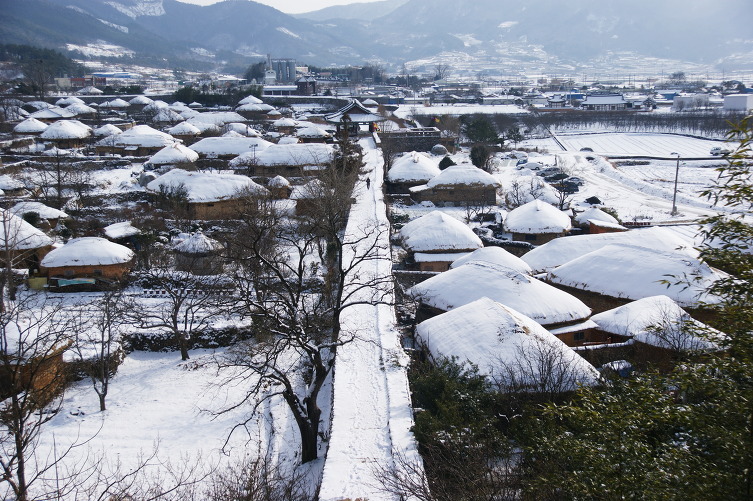 This will give you a brief idea of how a snowy Suncheon should look like. Would like to check with you, where is the boarding point for the Suncheon Station? Isit Ktx Suncheon station or ? Based on my experience back in December 2014, the boarding point is right outside the main gate/exit of the building of KTX Suncheon Station. but the tour bus is visible from the exit. How did you book for the tour the previous time? 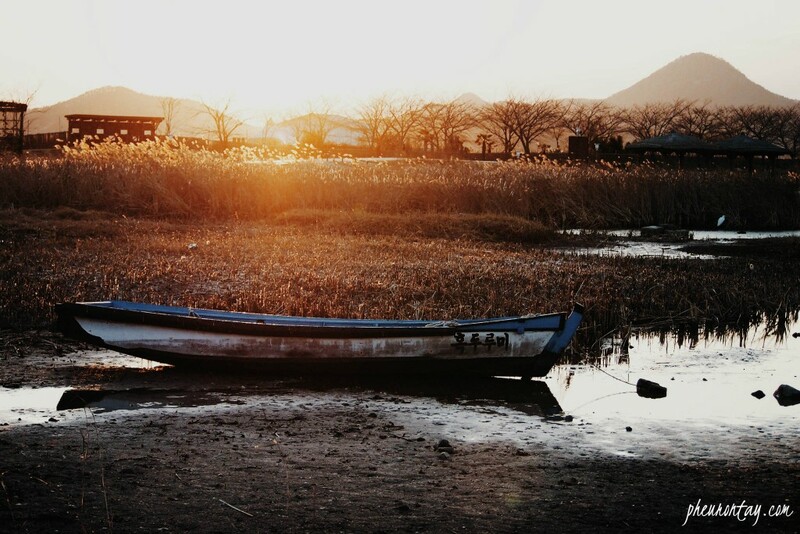 I decided to visit Suncheon after reading your blog. Thanks for the beautiful write-up. Can i ask if the city tour needs to be booked in advance? For someone who does not understand Korean, how can this be done? And if we miss the city tour, how else can we get around the places listed on your blog? Can I check where do you stay overnight in Suncheon? 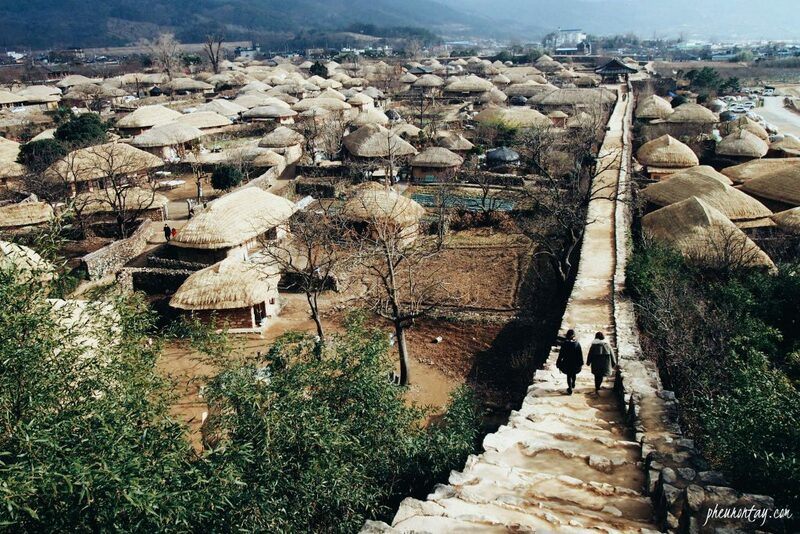 Because I would like to spend a day in Suncheon before going to Jeonju. I know this post is a few years old. I can’t seem to access the link to their official site, and no articles are updated now for me to see if they are still operational. 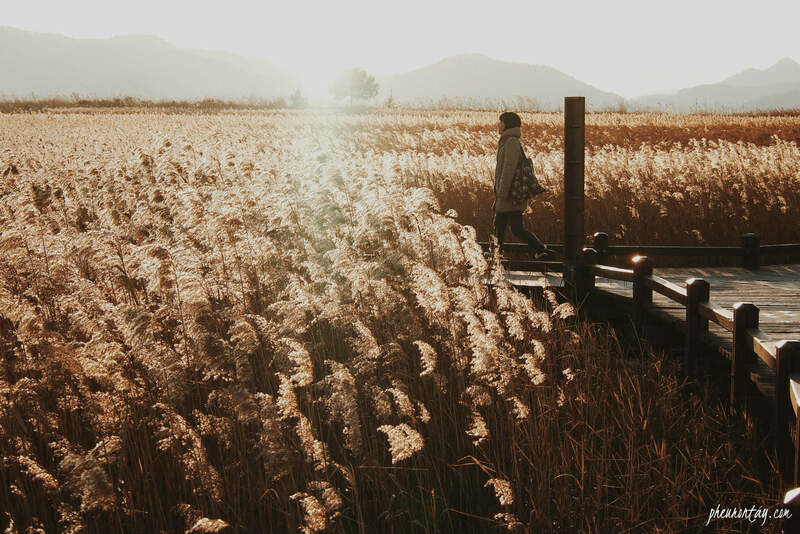 After reading this post I got interested in Suncheon and would really like to go on the city tour, since I wouldn’t be driving a car when I visit Korea. 1. Does Suncheon City Tour still operate as of now? 2. Did the city tour need reservation prior or I can just go to Suncheon Station before 9:50 (their supposed departure time) and join them? Hoping I can get help! Thanks in advance! Really nice photos and great, great writing! thanks for commenting. I just checked the website, the tour is still ongoing. I was able to book for my Suncheon city tour only via e-mail. I sent an e-mail inquiry to Suncheon city suncheonsi@korea.kr, and an officer from the city hall replied to me saying he will reserve a tour on my behalf. I provided him the date and received a confirmation the next day! No pre-payments were needed, I was told to just pay in cash once I get to the tour bus 🙂 Cool isn’t it! I thought would be a helpful for your readers! Thanks so much Bea! Indeed, Suncheon has really lovely people. Enjoy the trip! I did not cover Suncheon in one day. 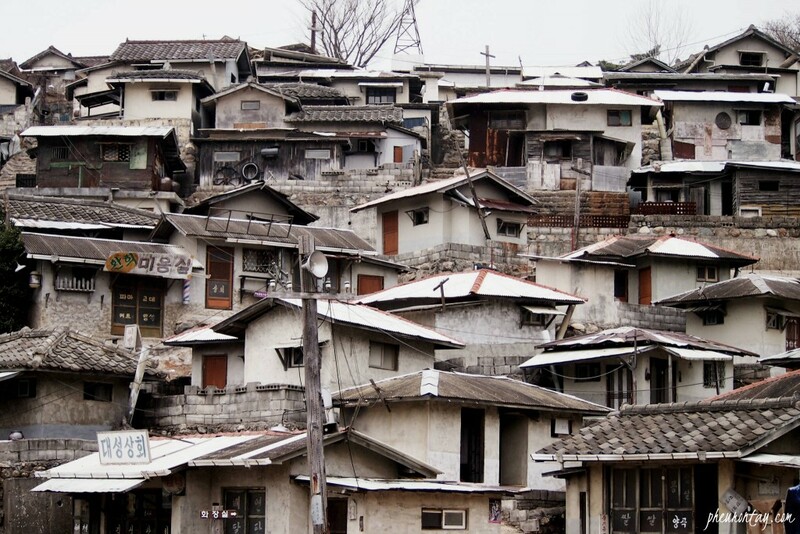 My route goes: Seoul — Jeonju 3D2N –Suncheon 2D1N –Seoul. Which means I left Jeonju fairly early in the morning that I am supposed to take this city tour, make sure i reach Suncheon Station before 9am, follow the tour, finished the tour in the evening, check into the hotel for a night and did some night tour in Suncheon myself. To see the correct departure/arrival time in the KTX site, you might want to use the ‘Hour’ field found beside the month and date in the booking section. Set it to maybe 18hrs (6pm) so it shows you if there are available trains during those times. 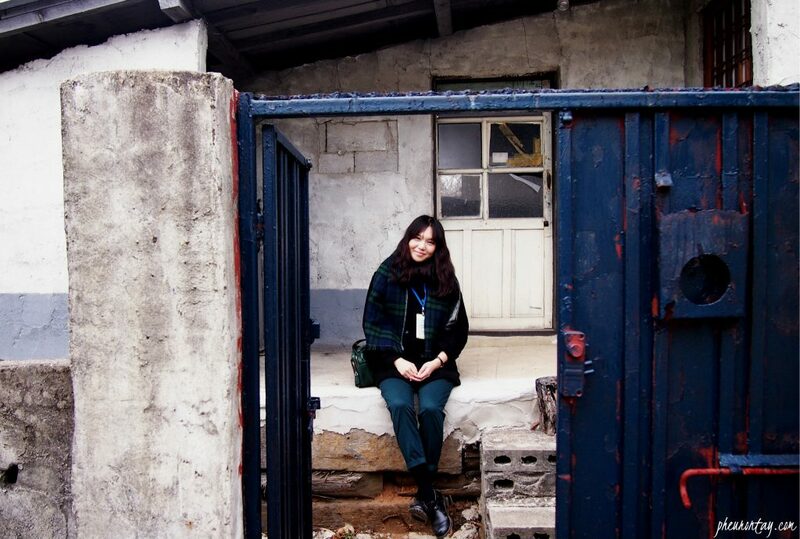 Thank you for your beautiful writeup on Suncheon, and sharing your experiences. I really like the honesty in your writing, like telling it as it is… It also helped me weigh my options about taking the city tour. It feels like although it’s very convenient, it’s too rushed… to give you that time you want to really immerse and enjoy the sights. Once again, thank you very much. I will be going to Suncheon and Yeosu during the Golden Week holidays (here in Japan). Tqvm for introducing Jeongju n SUNCHEON. Wat time is earliest train u took from Jeongju to SUNCHEON ? We have planned 3days2nghts Jeongju 2days 1 night SUNCHEON. What time is earliest KTS train from Yongsan Seoul to JEONJU? You may always check the KTX info here!